I don't like carving pumpkins. It's a gooey, nasty mess. But, it's something I will do every fall just to scoop out the pumpkin seed treasures. Yes, I know that they sell pumpkin seeds at the store, but there's nothing quite like fresh seeds roasted right out of the pumpkin. We ended up with a lot this year, so I thought we'd whip them into a few tasty treats. 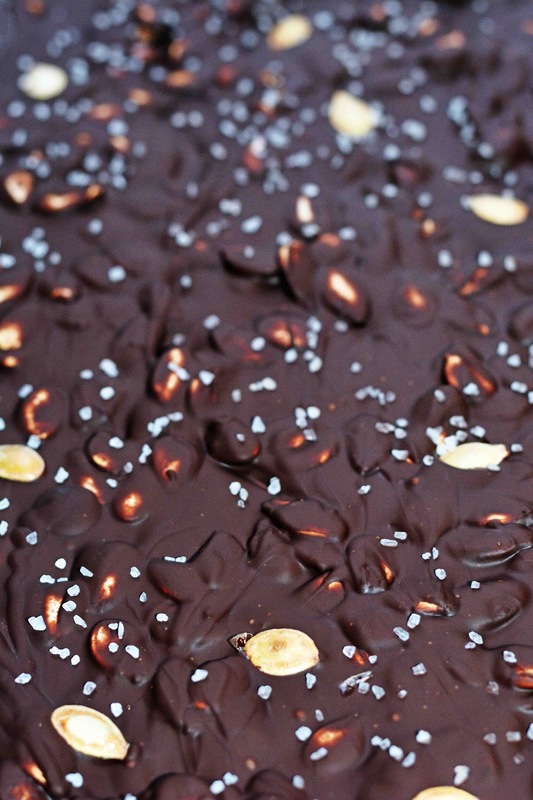 First, we made Dark Chocolate & Sea Salt Pumpkin Seed Bark. Melt chocolate over double-broiler, or in a metal pot over a pan of simmering water. Once chocolate is melted, remove from heat and stir in seeds. Spread a thin layer of the chocolate mixture onto wax paper. Sprinkle with sea salt. Allow to completely cool and harden. Break into small pieces and store in an air tight container. We also made some Pumpkin Seed Brittle. Generously grease a large rimmed baking sheet. Combine granulated sugar, brown sugar, water and corn syrup in a heavy-bottomed saucepan. Cool over medium heat, constantly stirring until the sugar is dissolved. Then, bring to a full boil. Increase heat to medium-high and continue to boil without stirring for 15 minutes, or until candy thermometer reaches 260 degrees. Remove pan from heat. Stir in butter and seeds. Return pan to medium-high heat and continue to cook another 5 minutes, or until temperature reaches 295 degrees. Be careful not to burn candy! Remove from heat and quickly add in baking soda and vanilla. Immediately poor the mixture onto prepared baking sheet. Spread the mixture into a thin layer. Let stand until completely cool and candy is hard. Break into small pieces. and store in an air-tight container. Do you eat your pumpkin seed straight or mixed into other tasty treats? I'd probably like the lighter version more and I like that last photo you took! I usually eat pumpkin seeds sprinkled on my breakfast slice of bread with some flax seeds and grated carrot or beet on a thin layer of sour cream. Because every now and then I love a little sweet and salty mix. All things in moderation, Dahling ;) I've never had the seeds on bread. I'll try that for breakfast tomorrow! you can grind them and make some pumpkin seed humus too as a spread with a spoon of butter. We actually have humus here with pumpkin seeds and with shitake shrooms too and garlic. You really should do a cookbook! There's plenty of bloggers who've had much success with their own e-books. I am sure your cookbook would do really well also! Wow! what great ideas! 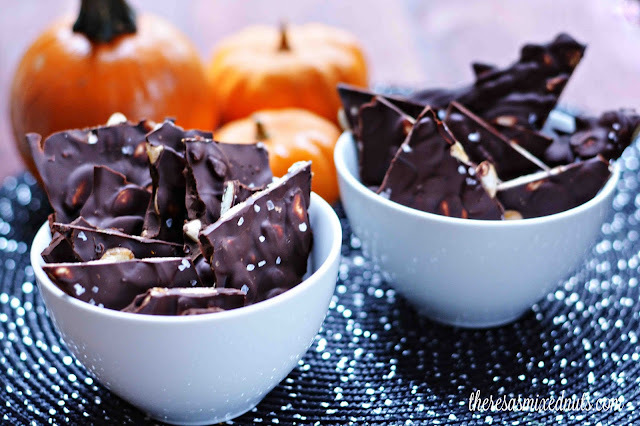 Your chocolate pumpkin seeds look divine! .....I would love to try them. Sadly, my boys carved their pumpkins at their grandmother's house and I didn't think to collect the seeds. What a bummer! I'd be so sad knowing my kids threw them out since it's one of the few things that get me excited for fall lol. I eat them straight at my sea, good to keep the parasites away too. I love to eat them straight too. Sprinkled with a little olive oil, they are fantastic! This was my first year making my own since I always thought it would be too complicated. I was surprised at how easy they were to make! YES! I love, love, love pumpkin seeds. One of my favorite snacks! Mine too, Robin! Such a delightful fall treat! Pumpkin seeds are the best! I love them in my trail mix. I've never tried them in a bark recipe before. It looks delicious. Oh, that pumpkin seed brittle looks so delicious. And it is so simple to make as well! Oh I love these ideas. I definitely wouldn't mind making some of that bark this year. It sounds simple enough for me to make too! 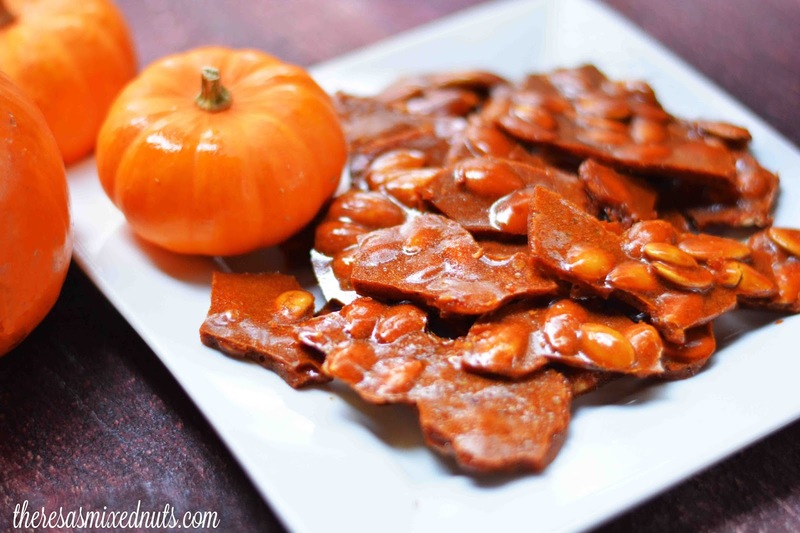 I have never had pumpkin seed bark or brittle before! That's such a cool idea, it looks really tasty. Oh this sounds delicious. We will be carving pumpkins on Saturday morning... and this looks like the perfect idea for the seeds! That is a neat idea. Those look really tasty and make a great snack. We love pumpkin seeds! We usually roast them, salt them and eat them, but I find your recipes far more appealing. looks really tasty! I love pumpkin seeds! I just roasted some. I was hesitant to do so after my pumpkin accident. That's still clearing up. I've seen a lot of recipes with seeds but nothing like this. It sounds great! I am not big on seeds. But, I woud definity try the bark. It looks good. I love pumpkin seeds! I've only had them roasted, but putting them in the bark sounds incredible. We eat them both ways. They are delicious added to salads! Oooo you know, I usually just throw away our pumpkin seeds!! :P Never thought to use them this way hahaha. Do you ship these out? Lol, so yummy looking. I cant wait to try this with all our extra seeds. Thank you for sharing. I LOVE pumpkin seeds!! Great recipes Theresa. HAPPY HALLOWEEN!!! I love the taste of pumpkin seeds but fail to remember that I can cook with them. That first recipe looks super yummy. Oh this looks so good! Definitely going to be trying these ideas out. great ideas, Theresa...and looks managable for me as well. Those dark chocolate must be perfect with roasted pumpkin seeds..